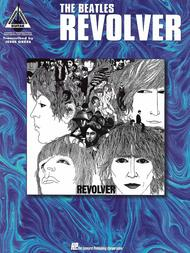 Revolver by The Beatles. For Guitar. Hal Leonard Guitar Recorded Versions. Classic Rock, Britpop and Psychedelic Rock. Difficulty: medium. Guitar tablature songbook. Guitar tablature, vocal melody, lyrics, guitar notation legend and chord names. 96 pages. Published by Hal Leonard (HL.694891).ISBN 0793526221. With guitar tablature, vocal melody, lyrics, guitar notation legend and chord names. Classic Rock, Britpop and Psychedelic Rock. 9x12 inches.At last - transcriptions to this landmark album, including the songs: Eleanor Rigby * Good Day Sunshine * Got to Get You into My Life * Taxman * Yellow Submarine * and more!About Hal Leonard Guitar Recorded VersionsGuitar Recorded Versions are note-for-note transcriptions of guitar music taken directly off recordings. This series, one of the most popular in print today, features some of the greatest guitar players and groups from blues, rock, and heavy metal. Guitar Recorded Versions are transcribed by the best transcribers in the business. Every book contains notes and tablature.